Alkalosis is the increased alkalinity of blood and other tissues, generally occurring when the blood pH is above 7.45. Alkalosis may be respiratory or metabolic. Respiratory alkalosis may be caused by hyperventilation, which causes a loss of carbon dioxide. Metabolic alkalosis may be caused by prolonged vomiting, which reduces the amount of hydrochloric acid in the stomach, diuretics, dehydration, endocrine disorders, or consumption of alkali. Metabolic alkalosis typically occurs with disturbed muscle function such as weakness, pain, cramps, and spasms, and may also cause hypocalcemia. Respiratory alkalosis may be acute or chronic. Acute respiratory alkalosis occurs rapidly, and the patient may lose consciousness and return to normal ventilation. Chronic respiratory alkalosis is maintained by metabolic compensation, where bicarbonate ion concentrations are reduced to compensate for decreased levels of carbon dioxide in the blood. Metabolic alkalosis may be chloride-responsive or chloride-resistant. alkalosis: An abnormally increased alkalinity in the blood. metabolic alkalosis: Metabolic alkalosis is a metabolic condition in which the pH of tissue is elevated beyond the normal range ( 7.35–7.45 ). This is the result of decreased hydrogen ion concentration, leading to increased bicarbonate, or alternatively a direct result of increased bicarbonate concentrations. respiratory alkalosis: Respiratory alkalosis is a medical condition in which increased respiration (hyperventilation) elevates the blood pH (a condition generally called alkalosis). Alkalosis refers to a condition reducing hydrogen ion concentration of arterial blood plasma (alkalemia). Generally, alkalosis is said to occur when pH of the blood exceeds 7.45. The opposite condition is acidosis (when pH falls below 7.35). Alkalosis can refer to respiratory alkalosis or metabolic alkalosis. The main cause of respiratory alkalosis is hyperventilation, resulting in a loss of carbon dioxide. Compensatory mechanisms for this would include increased dissociation of the carbonic acid buffering intermediate into hydrogen ions, and the related excretion of bicarbonate, both of which lower blood pH. 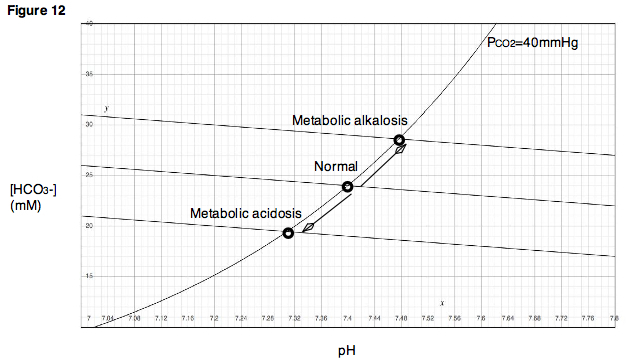 Metabolic alkalosis is a metabolic condition in which the pH of tissue is elevated beyond the normal range (7.35–7.45 ). This is the result of decreased hydrogen ion concentration, leading to increased bicarbonate or alternatively a direct result of increased bicarbonate concentrations. Metabolic alkalosis can be caused by prolonged vomiting, resulting in a loss of hydrochloric acid with the stomach content. Severe dehydration and the consumption of alkali are other causes. It can also be caused by administration of diuretics and endocrine disorders such as Cushing’s syndrome. Compensatory mechanism for metabolic alkalosis involves slowed breathing by the lungs to increase serum carbon dioxide, a condition leaning toward respiratory acidosis. As respiratory acidosis often accompanies the compensation for metabolic alkalosis, and vice versa, a delicate balance is created between these two conditions. Metabolic alkalosis is usually accompanied with hypokalemia, causing, e.g., muscular weakness, myalgia, and muscle cramps (owing to disturbed function of the skeletal muscles), and muscle spasms (from disturbed function of smooth muscles). It may also cause hypocalcemia. As the pH of blood increases, the protein in the blood becomes more ionized into anions. This causes the free calcium present in blood to bind strongly with protein. If severe, it may cause tetany (alkalotic tetany). Davenport Diagram: A Davenport Diagram, as shown, is a graphical tool developed by Allan Jones Davenport that allows a clinician or investigator to describe blood bicarbonate concentrations and blood pH following a respiratory and/or metabolic acid-base disturbance.